The crux of this piece is its size. It’s a full 2.5 inches across, and 3.5 high. That may not sound like much, but grab a ruler and you’ll quickly realize this is a monster. Cast from bronze, this is one huge – and heavy – piece of jewelry. That’s not a bad thing though – far from it in fact. Having this beast hanging from your neck is sure to get you noticed by the ladies, as well as any lads needing help opening their beers. Hardly historical (it is a bottle-opener, after all), it nonetheless commands an old fashioned bearing that could easily be incorporated into most costumes without looking glaringly out of place. However, it would be most at home on the chest of pirates that have a little pimp or gangsa in their attitude. 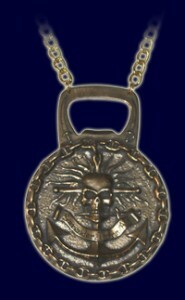 Pirate bling indeed! This entry was posted in Jewelry and tagged marcus cove by Bilgemunky. Bookmark the permalink.